t*rexes and tiaras: Treasure Hunt.. 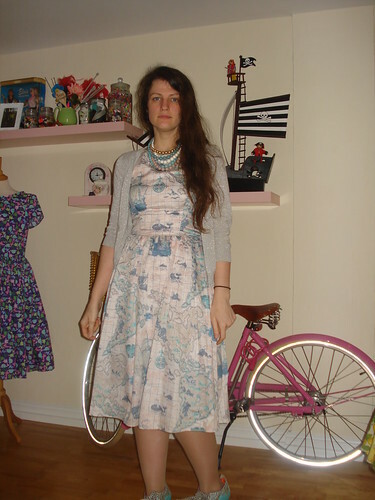 I've mentioned it a few times and wasted no time at all in ordering this Laura Ashley map print dress when it hit the website, but once it had arrived, I wasn't entirely sure what to wear it with first. The print is a little pinker than I'd thought it would be from the press photos, so I'd considered my pink cropped jumper, which seems to be becoming quite the wardrobe staple, lately. (See here and here). 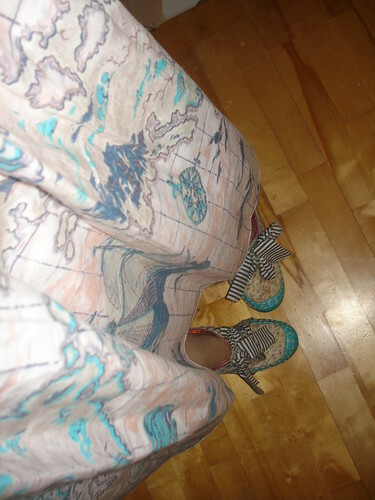 In the end, though the shoes dictated the rest of the outfit. I've got to admit, this #irregularchoicechallenge is a little more tricky than I'd bargained on. I've rediscovered pairs which I'd forgotten about, which is lovely, but I guess that the nature of the challenge is that once they're worn, they're worn, so it seems to be a case of being careful not to "waste" a pair, in case I find an outfit later on which would be a better match. 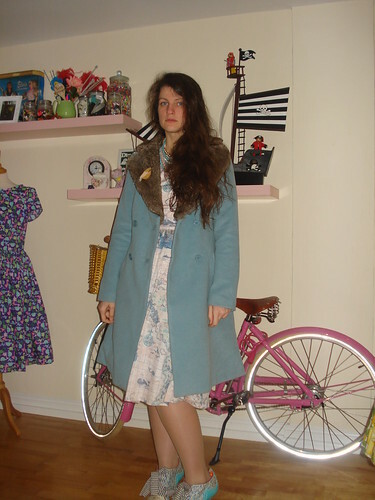 I decided that these Abigail's Party were a pretty good match for this dress, (well, this whole outfit really) and decided to let them have their day! Luck on my side, I managed to find a necklace in almost the exact same colours as the dress and added an old silver cardigan, bought many years ago from H&M and which has been used as a neutral for almost every colour or print I can think of. 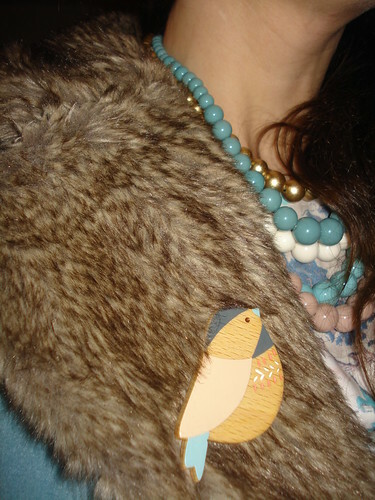 The pretty bird brooch is a rather new addition to my Louche coat; I love it's pastel colour scheme. Altogether, it turned into one of those outfits which just kind of worked. Maybe it was just my mood as it was also a rather good day. Thanks so much, I'm interested to see the total number as well. At least I've not yet got to the stage where I've worn something twice by mistake. I absolutely love this outfit on you Char. The necklace matches perfectly! I was admiring that dress in store at the weekend. There was also a lovely patterned green dress with a sweetheart neckline which I thought was very "you". That dress is even better on! Such a lovely, unique piece. Aw, thank you so much. I'm so glad it was as nice as it looked in the pictures! Aw, thanks.It's become quite the permanent feature on that coat. Super impressed with the quality, as ever with Laura Ashley. 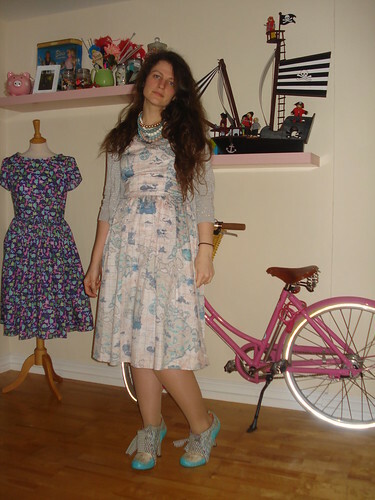 This dress is beautiful, I really love Laura Ashley, there's a few dresses I have my eye on! They do have so many amazing things at the moment. I looked at the dress, great pattern design, lovely style, tried it on, liked it, but poor quality for the price, I think most high street clothes are made in the same sweat shops abroad. So as usual I will try and find some nice fabric and make it. I do have trouble in finding quality fabric. I have to admit, I think these dresses have been pretty decent quality. They are expensive, though.